Great Night Extravaganza – This large assortment includes everything you will need for a good time. 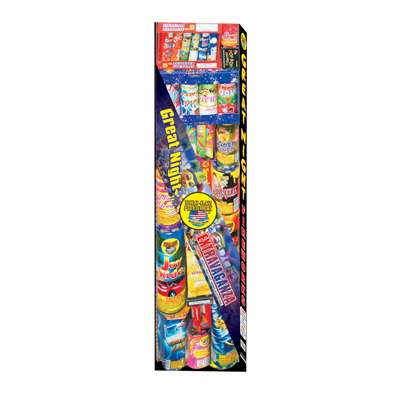 From novelty items for the kids all the way to artillery shells for that big bang everyone loves, the Great Night Extravaganza will be a sure crowd pleaser. Biggen Assortment - This assortment includes; 9 500 gram cakes, 12 large 200 gram cakes and 5 different artillery shells. Sizzler - Safe and Sane assortment. American Envy - What a DEAL! This large aerial kit includes six 500G aerial repeaters, three 200G repeaters, and two top-notch mortar kits! Team Sniper - This assortment includes four 200G cakes (Crazy Exciting, Just Hanging, Hostile Takeover, Grapes Over Vineyard) and a 6 shot Artillery Shell kit. What Boys Are Made Of Backpack - Convenient, affordable, reusable, age appropriate. Smoke balls, snappers, confetti, M-5000 firecrackers, fountains and more. And he'll have a handy backpack left when the party's done. Your one-stop grab-bag for that little guy in your life. Party Zone - Assortment of pull-string streamer items perfect for indoor celebrations! Thriller - Safe and Sane assortment.